The Nissan March (as the Micra is known in its homeland) PC goes on sale on Wednesday and is ugly enough to fit right in with the Halloween trick-or-treaters. 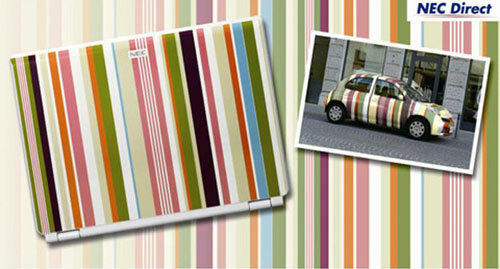 For ¥120,498 ($1,020), eager shoppers will get a stripy laptop that looks rather less Paul Smith and more garish mistake. Aside from the case of the PC sporting special-edition March colors, there’s a Nissan logo above the keyboard and it comes with a slipcase made out of - get this - the same material Nissan uses in the March’s seats. We’re not making this up - you’ll just have to trust our Japanese translation on this one. If you haven’t turned away in disgust by now, we may as well tell you that the computer is actually a standard LaVie G model with a 1.8GHz Sempron 3400+ CPU, 512MB of RAM, DVD-ROM drive, a 15.4in widescreen and Windows Vista Home Basic. Sponsored links: Unlock the key of your success for 000-979 dumps exams & 640-802 test by using our latest iseb certification and 70-667 prep resources and mcitp.